For residents in Assumption Parish, the boiling, gas-belching bayou, with its expanding toxic sinkhole and quaking earth is no longer a mystery; but there is little comfort in knowing the source of the little-known event that has forced them out of their homes. Located about 45 miles south of Baton Rouge, Assumption Parish carries all the charms and curses of southern Louisiana. Networks of bayous, dotted with trees heavy with Spanish moss, connect with the Mississippi River as it slowly ambles toward the Gulf of Mexico. Fishermen and farmers make their homes there, and so does the oil and gas industry, which has woven its own network of wells, pipelines and processing facilities across the lowland landscape. The first sign of the oncoming disaster was the mysterious appearance of bubbles in the bayous in the spring of 2012. For months the residents of a rural community in Assumption Parish wondered why the waters seemed to be boiling in certain spots as they navigated the bayous in their fishing boats. Then came the earthquakes. The quakes were relatively small, but some residents reported that their houses shifted in position, and the tremors shook a community already desperate for answers. State officials launched an investigation into the earthquakes and bubbling bayous in response to public outcry, but the officials figured the bubbles were caused by a single source of natural gas, such as a pipeline leak. They were wrong. On a summer night in early August, the earth below the Bayou Corne, located near a small residential community in Assumption, simply opened up and gave way. Several acres of swamp forest were swallowed up and replaced with a gaping sinkhole that filled itself with water, underground brines, oil and natural gas from deep below the surface. Since then, the massive sinkhole at Bayou Corne has grown to 8 acres in size. On August 3, Louisiana Gov. Bobby Jindal declared a statewide emergency, and local officials in Assumption ordered the mandatory evacuation of about 300 residents of more than 150 homes located about a half-mile from the sinkhole. Four months later, officials continue to tell residents that they do not know when they will be able to return home. A few have chosen to ignore the order and have stayed in their homes, but the neighborhood is now quiet and nearly vacant. Across the road from the residential community, a parking lot near a small boat launch ramp has been converted to a command post for state police and emergency responders. “This place is no longer fit for human habitation, and will forever be,” shouted one frustrated evacuee at a recent community meeting in Assumption. The Bayou Corne sinkhole is an unprecedented environmental disaster. Geologists say they have never dealt with anything quite like it before, but the sinkhole has made few headlines beyond the local media. No news may be good news for Texas Brine, a Houston-based drilling and storage firm that for years milked an underground salt cavern on the edge of large salt formation deep below the sinkhole area. From oil and gas drilling, to making chloride and other chemicals needed for plastics and chemical processing, the salty brine produced by such wells is the lifeblood of the petrochemical industry. Geologists and state officials now believe that Texas Brine’s production cavern below Bayou Corne collapsed from the side and filled with rock, oil and gas from deposits around the salt formation. The pressure in the cavern was too great and caused a “frack out.” Like Mother Nature’s own version of the controversial oil and gas drilling technique known as “fracking,” brine and other liquids were forced vertically out of the salt cavern, fracturing rock toward the surface and causing the ground to give way. “In the oil field, you’ve heard of hydraulic fracturing; that’s what they’re using to develop gas and oil wells around the country …”What is a frack-out is, is when you get the pressure too high and instead fracturing where you want, it fractures all the way to the surface,” said Gary Hecox, a geologist with the Shaw Environmental Group, at a recent community meeting in Assumption Parish. Texas Brine brought in the Shaw group to help mitigate the sinkhole. As the weeks went by, officials determined the unstable salt cavern was to blame for the mysterious tremors and bubbling bayous. Texas Brine publically claimed the failure of the cavern was caused by seismic activity and refused to take responsibility for the sinkhole, but the United States Geological Survey (USGS) has since determined that the collapsing cavern caused the tremors felt in the neighborhood, not the other way around. According to Hecox and the USGS, the collapsing cavern shifted and weakened underground rock formations, causing the earthquakes and allowing natural gas and oil to migrate upward and contaminate the local groundwater aquifer. Gas continues to force its way up, and now a layer of gas sits on top of the aquifer and leaches through the ground into the bayous, causing the water to bubble up in several spots. Gas moves much faster through water than oil, which explains why the bubbles have not been accompanied by a familiar sheen. Documents obtained by the Baton Rouge newspaper, The Advocate, revealed that in 2011, Texas Brine sent a letter to the Louisiana Department of Natural Resources (DNR) to alert its director, Joseph Ball, that the cavern had failed a “mechanical integrity test” and would be capped and shut down. The DNR received the letter but did not require any additional monitoring of the well’s integrity. Despite this letter, regulators apparently did not suspect the brine cavern to be the source of the bubbles until a few days before the sinkhole appeared, The Advocate reported. The letter raised ire among local officials, who did not hear about the failed integrity test until after Bayou Corne became a slurry pit. Texas Brine spokesmen Sonny Cranch told Truthout the company has not officially taken responsibility for the sinkhole disaster, but has “acknowledged that there is a relationship” between the collapsed cavern and the sinkhole. “It’s a tough problem. Nobody in the world has ever faced a situation like this that we’re grappling with,” Hecox told evacuees at a community meeting on November 13. At an earlier public meeting on October 23, Hecox said there is no “cookbook” for dealing with the sinkhole and, because the disaster is unprecedented, there is no clear path for a cleanup. After all, he said, you can’t “fix” a collapsed underground cavern. At the most recent meeting, Hecox told residents that installing methane monitors in houses near the sinkhole was one step that must to be taken if they ever wish to return home. At one point, an evacuee interrupted Hecox. Nick Romero is a former postal worker from Baton Rouge who moved to the Belle Rose community in Assumption parish to retire next to the bayous. “Until May 30, or whenever they reported the bubbles and stuff, everything was great around here, just great,” Romero told Truthout during an interview at his home near the sinkhole in early November. Romero has a small boathouse on the bayou behind his home, where he and his wife have lived for more than 15 years. Romero can simply push a button to drop his boat in the water and follow the bayou to his favorite fishing holes. But Romero has not gone fishing anywhere in the neighborhood since the sinkhole opened up nearby. “You just don’t know what could happen next,” he said. Every night before going to sleep, Romero surfs the web for updates on the sinkhole from various local and state agencies. Sometimes he wakes up in the middle of the night, worried about the sinkhole, and spends hours thinking about questions to ask authorities, or looking up information online. Romero said he sometimes smells the sinkhole, which sits behind a tree line on the other side of a nearby state road. The morning before the interview, he said, was the first time the fumes came into his house. The air outside was heavy and thick, and soon the smell was inside, hanging low about the house. Luckily, he said, as the day heated up, the fumes evaporated. Romero probably smelled the stench of the crude oil floating on the top of the sinkhole. Texas Brine has been skimming it from the surface and pumping what they can out of the ground. Romero and his wife among the last people still living in their homes on their block in early November.The rest had evacuated. Romero said they had finally decided to move out just a few days earlier, but they did not know where to go. Should they sign a lease on a new home? What if returning home became possible in a few months? Hecox and local authorities have made it clear that they have no idea when the evacuation order will be lifted. For the Romeros, there are too many questions and not enough answers. Romero’s decision to finally evacuate was partially based on serious health concerns: His wife is battling breast cancer for the second time in a decade. He gestured with his hand, naming nearby homes where residents had also developed breast cancer. From 2005 to 2009, Assumption Parish had the seventh highest breast cancer rate among Louisiana’s 64 counties, according to the National Cancer Institute. Romero is concerned about radioactive material that was produced by Texas Brine’s mining operation more than a decade ago. In 1995, Texas Brine asked state authorities for permission to dump “low amounts” of soils containing underground radioactive material into the cavern that is now collapsed. The “naturally occurring radioactive material,” also known as NORM, had accumulated in soils near the well pad as part of the brine production process. “This stuff is everyday stuff,” Cranch said. State officials found NORM in the sinkhole in August, but only at concentrations well below even acceptable levels. They determined it did not pose a risk to human health, and there’s no hard evidence linking the radioactive material to the cases of breast cancer noted by Romero. The NORM is simply another unknown on Romero’s list of worries. On November 27, the sinkhole had a “burp,” according to observers. Crude oil and woody debris rose to the surface, as water from a nearby swamp was seen flowing into the sinkhole. The “burp” roughly coincided with seismic activity recorded by the US Geological Survey. The sinkhole continues to shift and settle, as do the fractured rocks below it, regularly causing tremors and micro-earthquakes observed by seismic monitors. Shaw Geologist Gary Hecox believes the sinkhole may increase in diameter, and observers have found that the depth of the sinkhole has decreased from 490 feet to 140 feet. At a public meeting in mid-October, Hecox told evacuees that there is a considerable amount of subterranean material that has yet to be accounted for and may continue the frack out. At the time, the sinkhole measured 550 feet across, but Hecox calculated that it could grow to 1,500 feet across. When asked how many trees and living things could be killed by brine and oil leaking from the sinkhole, Hecox said he did not know. The hole won’t grow big enough to swallow the nearby neighborhood or state highway, Hecox said, but he continued to insist that the mandatory evacuation order is appropriate. When asked about the risks faced by those who ignored the order, which is “mandatory” but not enforced, Hecox repeatedly said that he would “not let his grandkids” live near the sinkhole. Cleanup work continues while residents wait for the undetermined end of the evacuation order. Some evacuees are staying with friends and family; others are renting places to stay while they wait. Texas Brine has recovered a considerable amount of oil from the sinkhole and formations below, but the company has failed to keep oil and other pollutants from contaminating nearby waterways, according to state officials. On December 1, Louisiana Commissioner of Conservation James Welsh fined Texas Brine $100,000 for failing to meet several deadlines for the cleanup effort. The company failed to install a containment system at the sinkhole to prevent contamination of nearby waterways by a November 16 deadline, Welsh said. Texas Brine also failed to meet deadlines for installing methane monitors in nearby homes and establishing a number of vent wells to burn off natural gas in the aquifer and other underground formations. “We cannot, and will not, tolerate delays or excuses in the effort to protect public safety and the environment, especially when the people of Bayou Corne still cannot feel comfortable returning to their own homes,” Welsh said. The company is also under state to orders to pay a weekly $875 stipend to each evacuated household. Vent wells set up by Texas Brine are now burning off the natural gas that contaminated local aquifer. Like flaming torches, pipes connected to the aquifer let flames fly into the open air as the gas makes its way out of the groundwater. 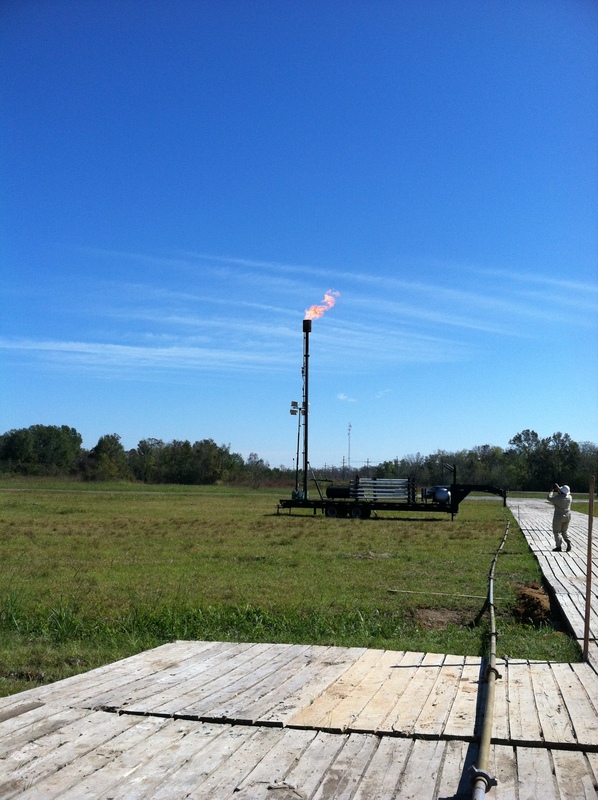 One vent well removing gas from the aquifer can burn about 46,900 cubic feet of gas per day. Public meetings and web postings provided by local officials, Texas Brine and state regulators provide the community with updated information on a near-daily basis. A spokesperson for Texas Brine told Truthout the company is trying to make its operations as transparent as possible. Transparency alone, however, will not bring the evacuees back to their homes. “We are doing all we can do…. Mother Nature has to take its course,” said spokesperson Cranch, who added that Texas Brine did not issue the evacuation order and some people have ignored it and returned home. Romero and other residents remain frustrated with Texas Brine. They say that simply complying with state orders to clean up the sinkhole is not enough, and the company should go above and beyond the call of duty to return them to their homes. The Bayou Corne sinkhole is not going away anytime soon. Texas Brine, state authorities and experts like Hecox have made it clear there is no magic fix for a massive slurry pit, a collapsed underground cavern and untold amounts of oil and gas escaping through the disturbed earth. These are difficult facts to face for residents like Romero. Even if they can return to their homes one day, he said, the neighborhood will never be the same. Why do we let these people run the place… The ecosystem shouldn’t be used as a quick fix scheme to aid economic growth! I am done. Action must be taken now! the world is controlled by psychopaths, we either thake it back by force of they will destroy it in their never ending quest for profit, I have had enough, it is time to defend ourselves and our homes against the corporate terrorists. We humans are willing to sell our planet to give in to the greed of some with NO benefits to ourselves. Isn’t it ashame that we have a defunct Federal government controlled by the corrupt Republican corporate MONARCHY’S political puppets that don’t give a damn about you or me! Their only concern is for their STOCKHOLDERS, the ONE-PERCENTERS with their FOREVER VACATIONING CEOS’!